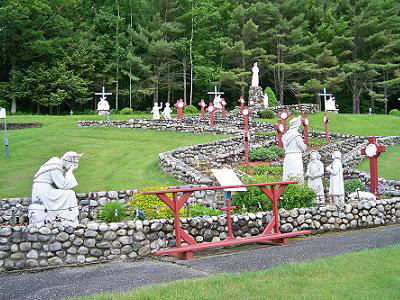 The La Salette Shrine in Enfield, New Hampshire is apparently going to be closing at some time in 2015, 87 years after they took over from the Shakers. So says an announcement from the Missionaries of La Salette, recently received at the Shrine and reported in the local press. I can’t say this is a surprise. This isn’t the first La Salette apostolate in New England to close, and may not be the last. It may be hard to attract visitors to a site that is mainly an outdoor shrine, with only a rather minimal chapel. 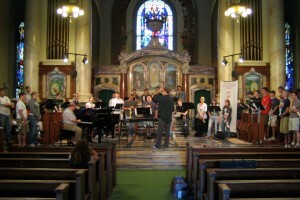 There was once an attractive church open to visitors, complete with a Casavant Freres organ. The missionaries’ first major work on the site was across the street from the current Shrine. In 1927 they bought a property previously occupied by a settlement of the Shaker sect, and they built a stately chapel in 1930-31 along with a seminary high school and a junior college. The college was later relocated and the school closed in 1974: the student body had produced few vocations. 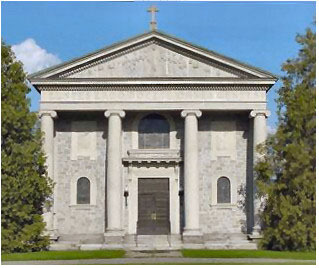 The Mary Keane Chapel remains today, now deconsecrated, as part of the local museum that documents the history of the Shaker and LaSalette presence at the site. It is used as a site for weddings and concerts. Activity at the Shrine in Enfield has been very low in recent years. An annual display of Christmas lights on the hillside attracts visitors; and the Sunday Mass serves locals and probably some tourists in the summer, but, going by this pamphlet of activities, Mass is only said at the Shrine chapel four times a week by the three priests on the staff. Normally, three priests would be saying Mass 21 times a week somewhere. Maybe they’re busy somewhere else. The current Shrine chapel, as you can see, is rustic, but I have always thought it was just a euphemism for ‘miserable’ in this case, dark and poor. Perhaps it is so dark and poor in solidarity with the poor of the world, and for the sake of nearness to nature. The ministry activities the missionaries offer include a preached mission focused on reconciliation with creation, creation spirituality, water conservation, and other related topics. The Shrine grounds also feature a “peace walk” area marked with a peace pole and portraits of “modern apostles”. The Japanese “interfaith” group that provided the pole says: “Thought forms create an energetic field strong enough to empower the course of planetary destiny.” Very inspiring, no doubt. Anyway, the order, falling in numbers, has withdrawn from some parishes it formerly staffed. 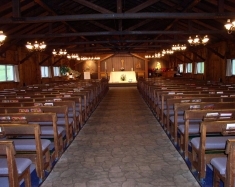 Closer to me, it sold its shrine and retreat house in Ipswich, Massachusetts in the 1980s, even though the church there once bore the title “National Shrine of Our Lady of La Salette”. The title was moved to their shrine in Attleboro, Mass. (between Boston and Providence), and that became the site of a substantial new church for pilgrims in 2002. As for the shrine in Enfield, perhaps (God grant it!) some other religious community could take it on and make it a home. New Hampshire, a state with one of the most unchurched populations in the country, needs people inspired with the light of the faith.